Gifted and talented education (GATE) programs are designed to provide gifted students a double-accelerated educational experience from the perspectives of academic study, social relationships and understanding the world. East Lansing Public Schools partners with Michigan State University and the Ingham ISD to offer this program. MSU provides three types of programs under GATE: academic year programs, summer programs and dual enrollment. Additionally, each program offers different courses. The academic year programs double-accelerate gifted students from seventh to ninth grades in either CHAMP (Math), ISHALL (English) or foreign language programs for high school credit. For example, in mathematics, one semester will equal one year of math. In essence, they finish a year of work all in one semester. 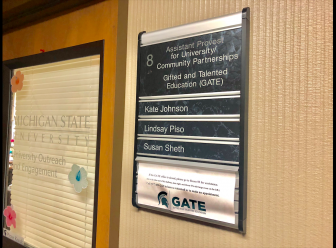 Glenn Mitcham, director of Curriculum, Instruction and Assessment of East Lansing Public Schools, said there are about five students from middle school and eight students from high school who participated in GATE this year. Five out of 759 students (0.7%) in East Lansing’s middle school participated in GATE this year. 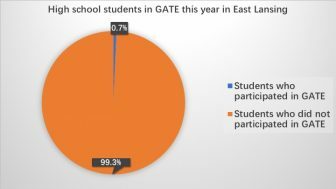 Eight out of 1,100 students (0.7%) in East Lansing’s high school participated in GATE this year. “These students who are doing extremely well are very bright students, and they are ready to accelerate,” Mitcham said. In the CHAMP program, students are dismissed early one afternoon each week from their respective schools to attend CHAMP, and each class lasts two and a half hours. In regular high school in Michigan, students have six classes a day, with each lasting one hour. The other issue is the cost. The way high schools are set up in Michigan is through a foundation allowance, meaning the state government sets aside money for a student. The student’s courses are one-sixth of the allowance, and East Lansing Public Schools take one-sixth of the funding they get from the state and pay it to Michigan State University, which covers most of the program’s cost. Another reason that could cause students not to attend CHAMP is the amount of self-guidance necessary to be successful. Mitcham said in high school, students are used to seeing their teacher and getting help every day. Because the CHAMP only meets once a week, students have to get used to emailing their professor, and it makes asking questions harder. Summer programs offer non-credit coursework for students from third to 10th grades who want to explore their interests in math, arts, science, leadership, technology and even medicine. The coursework focuses on the features of these fields. MSU GATE Office is located the Ground floor of Kellogg Conference Center in Room #8. MSU also handles dual enrollment, which allows high school students from ninth to 12th grades to enroll in college courses while still in high school to receive college or high school credit. Students have to meet the prerequisites and provide necessary test scores, and their counselor has to sign off on their application to the program. East Lansing Public Schools’ GATE program is supported by the Ingham ISD, a Regional Educational Service Agency. The agency offers programs and services to 12 public school districts. It supports school districts by holding meetings multiple times a year so districts who offer GATE can share information. Unlike MSU, which offers a variety of programs, Ingham ISD has limited programs and some programs are activities without a prerequisite. One of the programs Ingham ISD offers is Mathematics Augmentation Series: Cultivating Optimum Teaching (MASCOT), which used to focus on having math teachers learn to work with gifted and talented students and to improve their professional craft. Another popular program is called Kid’s College, a two-week learning experience for students in fourth or fifth grade who have an interest in science. “That is when students get older and their interest started to refine.” Rable said. Teachers could define gifted students solely by IQ testing, but the office is looking for the student’s intelligent potential. Rable said if a student has potential but does not use it, he or she may not be classified as a gifted student because of their unwillingness to work hard. Reversely, if a student who does not have high IQ or potential but works really hard could achieve just as much as a kid who has potentially higher ability. Mason, Mich., – The Thorburn Education Center was host to the monthly Ingham Intermediate School District Board meeting on Tuesday. Typically, meetings call to order at 6 p.m. EST, but at February 17th’s meeting the board decided to hold the meeting at 5p.m. The search for a new superintendent began following the meeting.